Want to see what's really happening in Brooklyn? You have to get out and explore! Here are some of the top destinations, worth a visit for even the most dyed-in-the-wool Brooklynite! 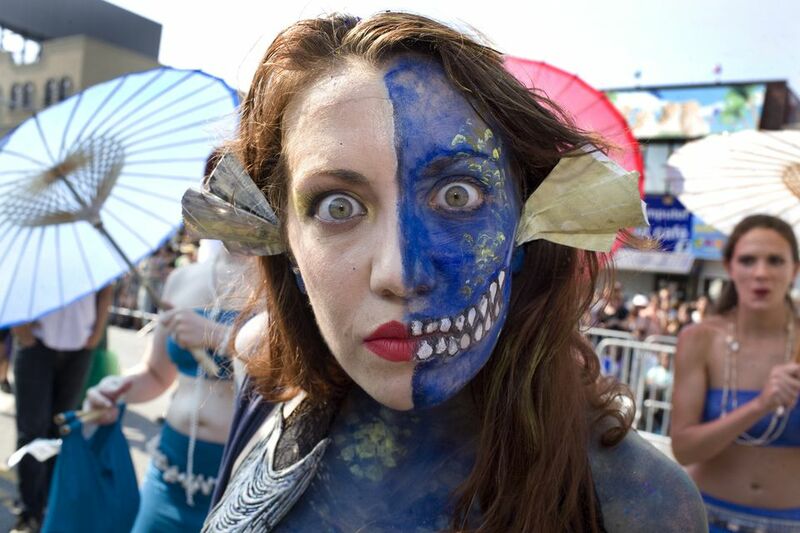 C​heck out the June Mermaid Parade. Check out the funky, wonderful seventy-year-old private Sebago Canoe Club, or the Sheepshead Bay Yacht Club. For tamer stuff, head toward Prospect Park. Sebago Canoe Club members sail kayaks and canoes into Jamaica Bay, a nature preserve, and occasionally offer instructional programs in sea kayaking, sailing, and flat water racing. It's just one of several sailing opportunities in Brooklyn. Miramar’s fleet of Ensigns, a one-design sailboat class, races regularly out of this club along with its larger sailboats, which compete with neighboring Sheepshead Bay Yacht Club. Check out the 60-acre beauty of a lake in Prospect Park that otherwise is off-limits for both boats and swimming. Brooklyn offers many outdoor athletic opportunities, including canoeing and kayaking in the lovely nature preserve at Jamaica Bay. For the most American of American moments, take a little trip to Brooklyn Bridge Park. Brooklyn Bridge Park is a wonderful destination for doing absolutely nothing but relaxing. It's a welcome respite for tourists needing a break from the hectic pace of the Big Apple. And, spectacular harbor views and breezes are so fresh that even died-in-the-wool Brooklynites may find themselves feeling like enthusiastic tourists. Here's how to get there. Brooklyn Bridge Park is an inviting destination for young families, too. Conveniently, there are lots of grassy hills for running, boats to watch and discuss, and a good playground nearby for tots. Special events: Watch listings for special events, including concerts and free summer outdoor movies and dance parties, at this wonderful venue. What's nearby: Nearby are the Brooklyn Ice Cream Factory; the bars, restaurants, shops , and galleries of DUMBO; the floating concert hall, Barge Music; DUMBO's interesting Front Street; historic Brooklyn Heights, and docks for cruise ships. A perennial favorite, a stroll through the Brooklyn Botanic Garden offers a contemplative environment that's also full of life — especially in spring. It's a nice destination for such occasions as Mother's Day, Father's Day, and romantic interludes. Want to make a splash and do something memorable for a special occasion? Whatever it is, if you want to make a splash (figuratively speaking), then do it on the Brooklyn Bridge. Find out everything you need to know about walking the Brooklyn Bridge. Indulge your historical imagination with a visit to an impressive Brooklyn landmark. If Brooklyn's Grand Army Plaza looks like it was airlifted out of Paris, that's because its architects fully intended to mimic Paris' famous Arc de Triomphe. The famous 1870 monumental arch was designed by Frederick Law Olmsted and Calvert Vaux, after what’s now known as the Place Charles de Gaulle. This imposing structure was built at a cost of $250,000 and unveiled in 1902 to celebrate the fallen heroes of the Civil War. If you happen to be there on the rare occasion when the structure is open, it's worth the hike inside.A six-story spiral staircase to the “Quadriga,” the horse-drawn chariot sculpture at the top of the arch. From the top, you’ll get an idea of the urban vision that park designers Olmsted and Vaux had in 1860 for bringing European-style greenery and airiness into cramped city life. Although Grand Army Plaza is a tiny plaza in the middle of a traffic circle, it's a favorite site for wedding and other photographers. Stand under the huge arch next to a bas relief of Presidents Lincoln and Grant. In the summer there's a lovely fountain in the middle of the plaza. Nearby are a number of interesting and family-friendly destinations, starting with the clean, great-for-toddlers Prospect Park Zoo, carousel and playgrounds, and the Brooklyn Botanic Garden. Head to DUMBO for an energy boost after a hike over the Brooklyn Bridge. Or make a stop here after a bike ride to Coney Island. And, when planning such special occasions as Mothers Day, Father's Day, Valentine's Day, Easter, anniversaries and of course, children's birthday parties, don't forget DUMBO as a sweet spot for shopping for gifts and goodies. DUMBO boasts two decadently delicious candy stores, and also the picturesque Brooklyn Ice Cream Factory. The latter churns out small batches of famously good ice cream, artisanal style. And, Almondine is a popular little cafe serving yummy baked goods and sandwiches. For excellent croissants and French pastries: Almondine Bakery, 85 Water Street. Still got a sweet tooth? Check out the best chocolate stores in Brooklyn. What Exactly Is a Stoopnic? What is a stoopnic? It's a made-up urban vocabulary word referring to a picnic on a Brooklyn stoop. A noun, it is pronounced "stüp-ˈnik." Typically, a stoopnic is a good excuse to see observe and comment about what's going on in the neighborhood, to comment on the street, and to shmooze and chat with neighbors passing by. To have a stoopnic, one must have a stoop, also known elsewhere as the outside stairway to the house. If you happen to be lucky enough to a) live in a home with inviting front stairs overlooking the public sidewalk, and b) get nice weather, then it's fun, whatever the occasion, to spread a tablecloth, make some sandwiches and sit on the stoop for a picnic. When to Have a Stoopnic? Anytime. They are best when spontaneous, and for special public celebrations such as the arrival of Friday afternoon, Mother's Day, Father's Day and repeat 39th birthday celebrations. Last but not least, no self-respecting list of activities for a Brooklyn tour could omit that most Brooklyn of all destinations, Coney Island.